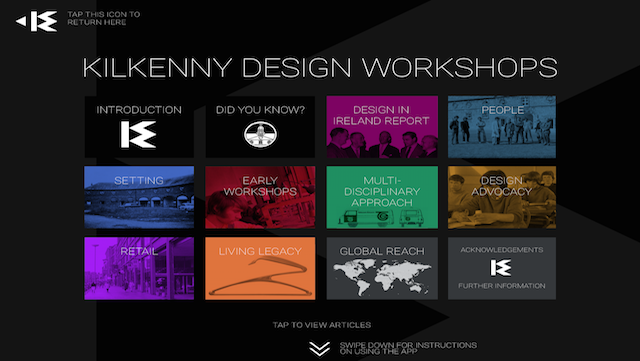 Kilkenny Design Workshops (KDW) is back in the picture once again, in a new iPad app which has been designed and developed in its former studios in Castle Yard, Kilkenny. The story of KDW is told within the new app with rich interactive elements and recent audio clips from KDW alumni as well as photographs from the era, beautiful archival film footage and design content, some of which have just been made public for the first time. Users can explore the studios through embedded archive film, tap to absorb the sights and sounds of the workshops in operation, listen to packaging designer Holger Strøm explain the concept for his iconic IQlight® and swipe through 1960’s KDW retail brochures or zoom in to see the former Ormonde Stable buildings and panorama of adjoining Butler House Gardens. The KDW app features television interviews with William H.Walsh, the visionary KDW founder and recordings of Åke Huldt, who was part of the invited Scandinavian group to audit design in Ireland in 1961, which later published the critical report commonly referred to as the ‘Scandinavian Report’. Users curious about the contents can read and tab through their findings in the complete ‘Design in Ireland’ Report within the app. While using the app over the weekend I was amazed to see so many interesting facts about KDW in the “Did You Know’ section! 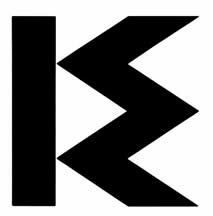 The KDW logo was designed by Louis le Brocquy. In the 1980’s KDW designed toilet paper dispensers for Nokia. The app is a joy to use on the iPad, the layout and transition from each area is superb and all for free!! The KDW app has been part funded by the Heritage Council Management Grant 2014 and by the Design & Crafts Council of Ireland. The KDW app was designed and developed in Castle Yard, Kilkenny by Red Lemonade Creative, with content developed by Ruth Mulhern and produced by DCCoI. The KDW iPad App is available to view in the National Craft Gallery, Kilkenny and visitors are invited to browse the app and enjoy the interactive elements. For further information, please visit www.kdwapp.com or download the iPad app on the App Store. Previous ArticleTwitter Is About Timing, All About Timing!